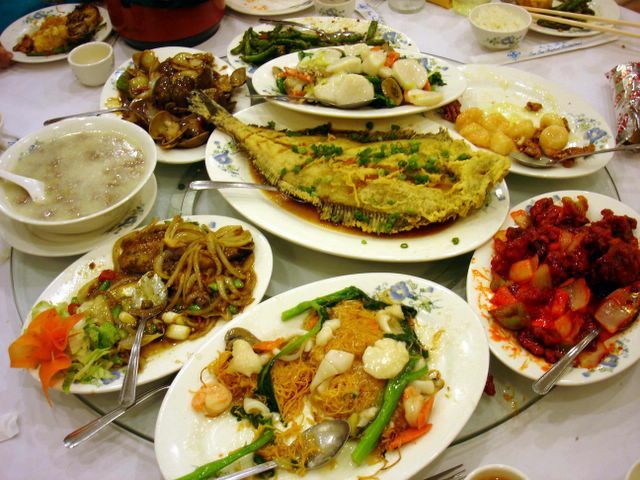 Nothing equals the experience of a traditional Chinese feast, where upon dish after dish crowd a Lazy Susan enticing the eyes and stomach with a dizzying and colorful array of choices. Chopstick in one hand, I use my other to twirl the turntable like a contestant on Wheel of Fortune, stopping only until the plate of food I want is in front of me. My actions topple a water glass across the table as the dishes sweep by, knocking every obstacle in its path. Outta my way! I grab a glazed walnut from the dish of Honey Glazed Walnut Shrimp and bite down into it. It's like candy; crunchy and coated with crystallized honey. Then I pop a plump, bulbous shrimp into my waiting mouth. It is succulent and sweet, with just the right amount of mayo sauce perking up my taste receptacles. Afterwards, I shovel some rice to cleanse the palate for the next morsel. Oooh! What's this? Scallops with Stir Fried Vegetables? I spoon some into my rice bowl. 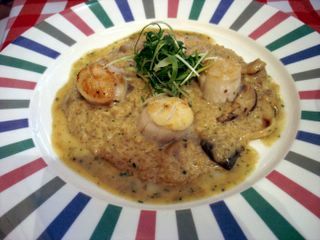 The scallops are enormous and thick, like steaks. It's meltingly soft and briny. That Deep Fried Flounder is calling my name now. I tear off a piece of flesh from the fish and dab a little of the soy broth onto it. 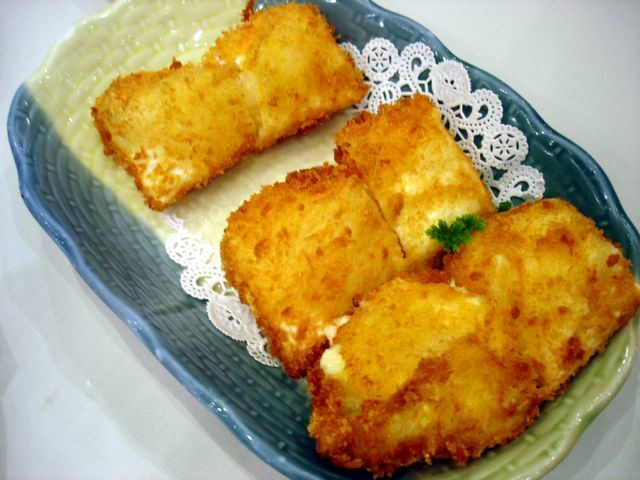 The flounder has a firm yet supple texture, while the light crunch of the batter complements. I take some Dry Fried Green Beans next. These were first oil-blanched until they blistered, and then stir fried with lots of garlic. Yum! Each bean pod still retained that crunchy bite. I ladle some hot congee into my soup bowl. Then I slurp with gusto. It's a warm, starchy refresher with little bits of chopped beef for flavor. What's this now? Clam with Black Bean Sauce! I position the half shell in my mouth and extract the clam belly, scraping it clean with my front teeth. The salty and pungent fermented black bean gives it a nice funk. The onions and bell peppers contribute a veggie crunch contrast to the squiggly, slippery clam meat. Oooh, there's the Oysters with XO sauce. These suckers are huge and fat, like little sea pillows! A little too big for my taste though. The meat is spongy and has that green pulpy stuff in the middle. Never did like oysters when they get this large. The XO sauce is tasty, but a little too oily. I try the Crispy Seafood Chow Mein next. It's excellent. Satisfyingly crisp deep fried noodles, delectable gravy and fresh chunks of seafood. Wait. Is that Sweet and Sour Pork?!? Who ordered this? I'll pass! It has a color that should not occur in nature. Everything tastes better when served on table that spins. Pupusas. If there's one thing that's been floating around in the food blogosphere that I couldn't wait to get my grubby hands on, it's pupusas. 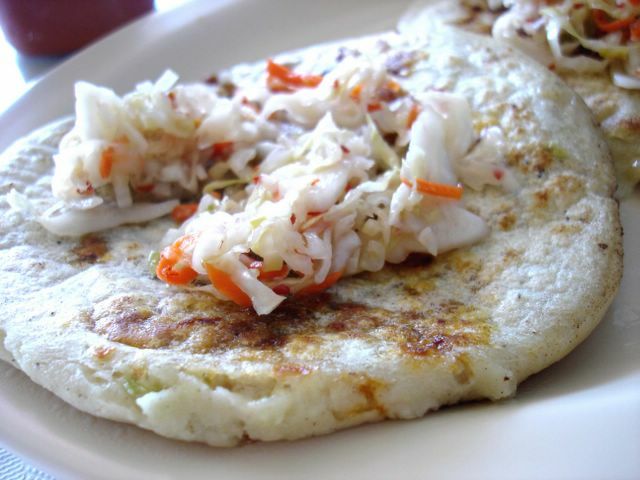 Everyone, it seems, has written effusively about pupusas. Pam of Daily Gluttony wrote about it. Kirk of mmm-yoso! wrote about it. But as drool-inducing as these posts were, they didn't get me closer to any pupusas since Pam's in L.A., and Kirk's in San Diego. 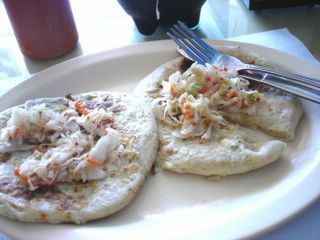 I had no pupusa leads in O.C. That is, not until now. Enter Professor Salt. Gilligan's Island may have their Professor, but I didn't need a radio made from a coconut; I needed pupusas. Chowhound's resident "Ph.D. in Food Appreciation" and published O.C. 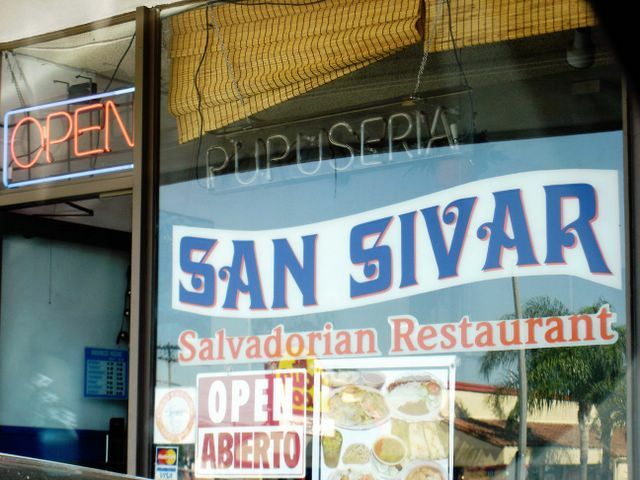 food sage, Professor Salt wrote up a brilliant essay on his favorite pupusas, found at a-hole-in-the-strip-mall called Pupusería San Sivar in lovely Costa Mesa. And this definitely is as divey as hole-in-the-walls get. My kind of place! Walking into the door, I got the sense that I entered into a battered cantina in the middle of nowhere Central America; something out of that movie "Motorcycle Diaries" or "El Mariachi". Bright yellow table cloths clashed with the peeling deep blue wallpaint. Chotskys dangle from the ceilings and worn posters promoting El Salvador tourism plastered the walls. Other than a narrow one-way mirror that looked out from the kitchen, there was no sign that anyone was minding the store. The joint was empty. Then, a young gentleman finally came out, dressed in jeans and t-shirt. He handed me a menu as I took a seat. 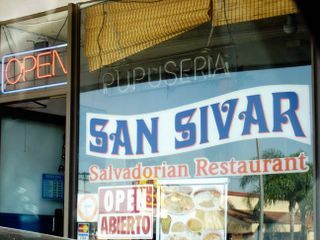 I pointed to two items on the pupusa side of the menu; one cheese filled ($1.90) and another with beans and pork ($2.00). "How big were these pupusas," I inquired. The young man curled his thumbs and forefingers into "C's" and brought them together. "Ahh, muy bien," I nodded in approval. Then, feeling pretty confident that I could squeeze out a few more words from my high school Spanish class, I said to him "Agua para beber, por favor." He smiled knowingly and took my order to the kitchen. A few minutes later he returned with a chilled squeeze bottle of piquant hot sauce and a black plastic mortar filled with "curtido", which I learned from Professor Salt's pupusa-primer as vinegared cabbage laced with chili flakes. This slaw is meant to be eaten as roughage with the pupusas. As soon as the pupusas were served, I used the metal tongs to mound some curtido on top of it. The crisp, slightly burnt masa dough had a pleasant subtle corn taste; smoother in texture than grits, but not as sweet as polenta. The Professor was right though; these puppies must be eaten immediately to appreciate the full potential of crisp crust and hot filling. The hot cheese pupusa reminded me of a quesadilla, but more substantial. The oozing and rich molten goodness went perfectly with the tangy, crisp and cool curtido. The bean and pork pupusa was even better. Sandwiched between the grilled masa dough was a thin layer refried beans and shredded pork, with a slight chili heat and aroma of cumin. Like a flattened, gridled tamal, this was my favorite out of the two. "¡Las pupusas son muy sabrosas!" Cafe Hiro - Cypress - For the third time! Yes, I know I write about this place a little too much. And I dine here, a little too much. By now, I've brought just about everyone I know to this place. Perhaps, at times, I build up their expectations so much that I think some of them don't end up absolutely loving it like I do. I shouldn't take it personally, I know. It shouldn't come as a surprise that everyone has individual and distinct tastes in food, just as they would in movies. As I cannot expect everyone to love one of my favorite films, "Tampopo", a quirky Japanese food flick, I should not expect them to like every restaurant that I like. After all, I don't think any amount of cajoling will ever get me to like Star Trek movies either. As I accept this fact, I am unswayed from my opinion that Cafe Hiro is one of the best values for fine cuisine in Orange County. For $15, not only do you get an entree like the one shown above (Seared Diver Scallops on Risotto), but also a refreshing salad of greens in a ginger-miso dressing *AND* a sublime, creamy homemade soup of the day. The seared scallops dish itself would probably set you back twice as much at restaurants in Vegas. And after spending exactly that much at such restaurants for mediocre food, I always come running back to Cafe Hiro, thanking my lucky stars that it is here in my backyard. Sure, there are misses at Cafe Hiro, along with the hits. Their duck breast and the hamburger steak are the weakest and most disappointing dishes of the bunch, but everything else, in my humblest opinion, is spot on and perfect. 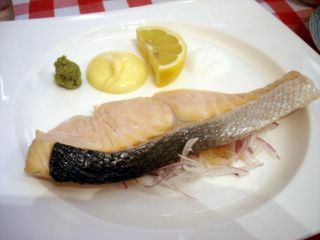 Their Steamed Wild Salmon, which seems to be permanently on the "specials" board, is almost Zen-like in its simplicity. Presented nakedly on a stark white plate, the pink salmon steak is flanked by four condiments, set neatly in a linear arrangement. A lump of grated green horseradish. A saucer of yuzu dressing is also provided in case you require any extra "oomph". The salmon is delicate and pristine; its essence and flavor unobscured. This is, perhaps, a calculated move by the chef. The other salmon dish they offer (Salmon Saiko) is, by contrast, bold and deeply infused with a dark marinade. So there it is, my third and probably not the last post on Cafe Hiro. There's a new fish in town. Or to be more precise, a new place to eat fish. 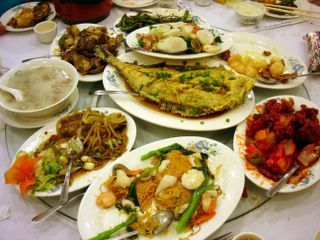 And who doesn't need to eat more fish nowadays; that is, unless you are pregnant or nursing. Okay besides that, we could all do with less red meat, pork, and grease, right? Well, alright...only if you don't ask for garlic butter to be brushed onto your fish, and oh yeah...you probably shouldn't ask for the fries either. Okay, well let's say you did intend to eat healthy. At Malibu Fish Grill, you can. First, choose the rice pilaf instead of fries, and cajun spices to top your fish instead of the garlic butter. Yes, here you have ample opportunities to feel good about what you eat and the best part is that you aren't paying the usual King's ransom (yes, I'm talking about King's Fish House) for a plate of grilled fish and two sides. Average price for a such a meal at Malibu Fish Grill? Around eight bucks. 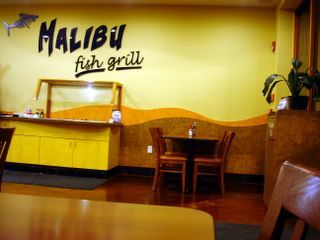 If you are familiar with California Fish Grill, which has locations in Anaheim, Cypress, and Gardena, you'll get Malibu Fish Grill immediately. They are cut from the same cloth; a "fast-casual restaurant" with something finally worth eating. 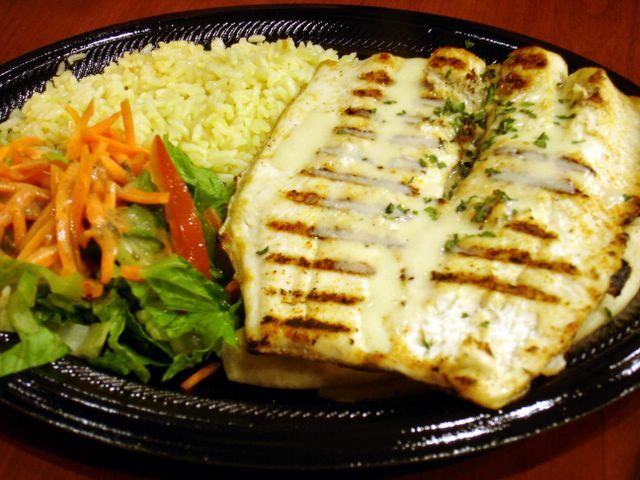 Both specialize in grilled fish of various species (mahi mahi, salmon, white roughy, etc. ), and they also offer fish tacos complete with a salsa/tartar sauce bar. Malibu Fish Grill, although it's got the sleek lines and finish of a chain, does the food right. A "special" of trout was grilled expertly, with the skin lightly charred while the fish was still moist. The butterflied fillet was then brushed by request with garlic butter and placed on top of grilled pita bread, served along side rice pilaf (or fries) and a salad dressed with Italian. The rice pilaf is good (eventhough I've never been a fan of pilaf in general), but the fries are better. These are your typical fish n' chip fries, but since they are cooked to order and tossed with salt in a metal bowl, it trumps anything you'd get at, oh lets say, Denny's. Okay, I know, that's really not much of a comparison. But seriously the fries were crisp, hot and dusted with parsley (nice touch!). They've also got fried calamari baskets, crab cakes, and even shrimp brochettes; all of which I intend to try during my next visit. Yeah, I know. It'll be stretch if I tried to make the case that deep fried calamari and crab cakes were healthy. But as long as it's not red meat, or bacon, it's gotta be good for me right? Right? Chicken Karaage a la Chowhound! Ain't Chowhound grand? A few months ago I asked for a recipe for karaage on the Home Cooking board and got a response from a Chowhound who was currently attending culinary school in Japan. And wouldn't you know it? She had just finished covering karaage in class! 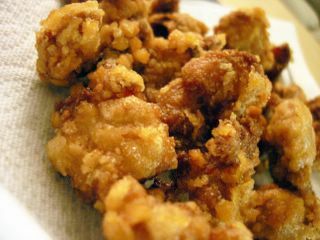 If you don't know what Chicken Karaage is, you might recognize its other, more "Americanized" name: Sesame Fried Chicken. Here is the link to her recipe. Since then I've made this recipe part of my cooking routine. The chicken is moist on the inside, crisp and crunchy on the exterior and has the distinct nutty, gingery, and robust flavor I've come to expect. The aroma from the sake and soy permeates deep into the chicken. This is exactly the dish I enjoy in restaurants. I marinate the boneless, skinless breast chunks (I cut the pieces to about an inch and a half wide and half an inch thick) in 6 parts sake, 3 parts soy sauce, and 1 part grated ginger juice, and I seal inside a ziplock bag, leaving it in the fridge overnight. The next evening, I shake off the excess marinade, and roll them in cornstarch as Yukari suggested. Tapping off the excess cornstarch, I let them rest on a plate while the oil heats. As soon as the oil was hot enough (see her recipe for the exact temperature), I fry small batches at a time. Since these were white meat pieces, I cut down the cook time by half, so as not to dry it out. If using dark meat (which, by the way, tastes more authentic) follow Yukari's directions and cook a little longer. After about two minutes of swishing around in the oil, before they take on too much color, I take them out of the oil and let rest on a clean plate. I think the resting process is crucial in making this dish properly. The resting allows enough carry-over heat to cook the chicken thoroughly and also allows the juices to redistribute while it cools. This time also allowed the oil to heat up sufficiently for the final fry, which will give the chicken its final golden color and crispness. After a good five minute resting and cooling time, I perform the final fry on high heat, also in small batches. As soon as I detect a faint golden brown (took no more than a minute and a half for me), I lift the pieces out to drain on a paper towel. Serve with a wedge of lemon....and viola! Unlike North Hollywood or Thai Town in L.A. proper, we in O.C. have to hunt for our Thai food. Thai restaurants are scattered around our fair county like Easter eggs in a spring garden. Finding out where the good ones are requires that you know the right people who know of the right places. Thankfully, all the right people, like Mealcentric, Diamond Dog, and Curt of Chowhound, have shown me where to look. 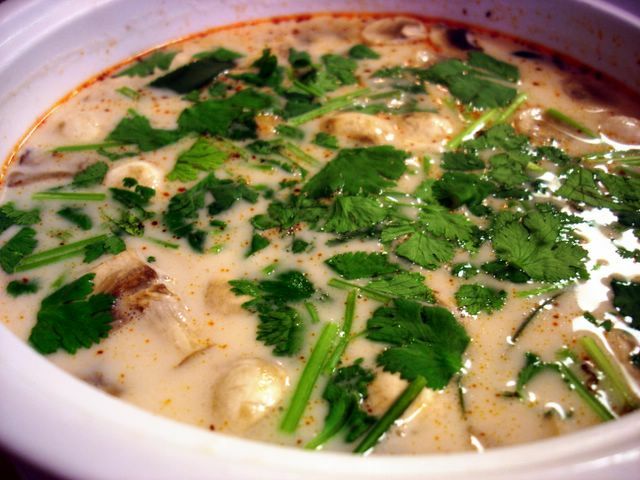 Not too long ago, Curt introduced me to Zesty Thai at a food court nestled in an office park in Irvine. I am now addicted to their Pad See Ew, which I think is better than those I've had at Krua Thai, Thai Nakorn, and Lotus of Siam. Yes, their Pad See Ew is that good. Find it funny that I found it at a food court? Well, that's the thing about Thai food in Orange County -- it's all about knowing where to look, no matter how unlikely the location might sound. So it came as no surprise when Mealcentric and Diamond Dog clued me into Bangkok Taste, a proverbial hole-in-the-wall inexplicably located next to a Big Lots in Santa Ana, of all places. They said it was worth a try, and they were right. The restaurant is small. It's a single room no bigger than a typical Chinese take-out joint with an order counter and a small square opening behind the register where plates of food are slid out from the kitchen. But the restaurant is well lit, bright, and inviting. Overhead, there are mini faux crystal chandeliers which sparkle. Above, two fluorescent light panels are covered by decorated stained glass, giving the illusion of skylights. The walls, decorated with framed artwork intricately crafted of beads, are themselves made of elegant faux-stone. The owners made the best out of the space they were alotted and succeeded. The night we dined, we were alone in the restaurant. It was the just the two of us, the server (a twenty-something Thai gentleman), and the cook (presumably, his mom). Sitting there in the empty restaurant, we heard her wok clang and our food sizzle as twangy Thai music wafted through the air. After a while, the door jingled as a customer came in to pick up an order he phoned in. As he left, he held his parcel of food aloft and said jokingly to the Thai gentleman, "You should try this place, they're great!" The food arrived shortly thereafter. We started with the Tom Kha Gai, chicken soup flavored with lime juice, coconut milk, galangal, bruised kaffir lime leaves, sliced lemongrass, and cilantro. 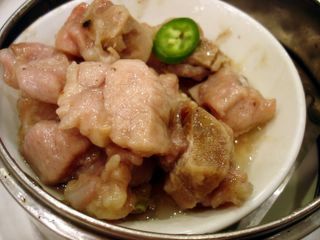 Instead of straw mushrooms, which is typically used in this dish, it was criminis. Although not as meaty or sultry as the straw, the criminis were cooked well so it worked. The morsels of dark meat chicken were plentiful and had a pleasant and tender chew. The one thing I noticed was lacking was the heat of chili, which wasn't a problem to me. But the dominant flavor of the soup; lime juice, could have been tempered with a little bit of sugar or perhaps more coconut milk. Nonetheless, it was a refreshing start. The tartness of the soup primed my palate for the meal to come. The Mussel Omelette came next. It was wide and circular; a disk the size of a small pizza. 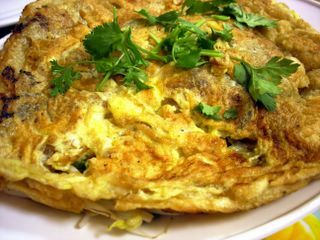 Beaten egg and glutinous rice flour envelop chunks of briny mussel meat in this crispy, eggy, and chewy creation. The bed of bean sprouts added some freshness and a cooling touch to the dish, while a sweet and sour chili sauce tied it all together. This was almost as perfect as Lotus of Siam's version, but not as crispy. But I loved this dish, and I'm positive I'll order it again on my next visit. The Pad See Ew was a dish of flat rice noodle stir fried with beef and Chinese broccoli. Bangkok Taste's version is a lot wetter than others I've tried but still well-flavored. My one and only gripe, was that the broccoli was undercooked. It tasted a little on the raw side actually, which meant that it didn't work in unison with the other ingredients as much as I would have liked. 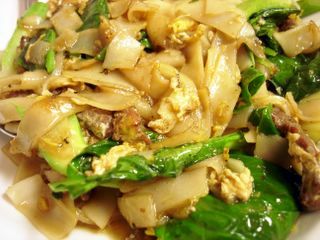 The perfect Pad See Ew, I think, occurs when all the components; starch, protein, and vegetable, dance in lockstep in a perfectly choreographed balance of tastes and textures. An undercooked piece of broccoli can easily shatter this harmony. That isn't to say that this wasn't a good plate of Pad See Ew, just not as great as my new benchmark for this dish; Zesty Thai's. So now I've got another Thai restaurant to put in my rotation. Over time, in more visits, I hope to discover more of Bangkok Taste's Easter Eggs in its own menu. Dim sum. How different would it taste without the wait? If it is true that the spring wouldn't be as sweet if there was no winter, dim sum must taste proportionately better the longer the wait, right? That's what I told myself when I was stuck in dim sum purgatory this past weekend at Sea Harbour in Rowland Heights. The hostess, presiding over a podium with a notebook and a stack of paper scraps printed with numbers, handed me one with "91" on it. "Twenty to thirty minutes," she said. No problem. We can do thirty minutes. The dim sum waiting room was full of people like us, standing around, sitting, milling, twiddling thumbs. Old Chinese ladies with sleepy eyes. Spiky haired teens with Gap ensembles. Families with smiling toddlers in tow. We were all there waiting for a taste of what would be our lunch. Thirty minutes came and went without our number being called. Hmm, what's the hold up? My stomach growls. Thirty five minutes. The hostess announces another number, in Mandarin first and then in English if she doesn't get a response. We find that it wasn't "91". Forty minutes. Another number. Nope that's not ours either. But at least they're up to the 80's. We could be next! I shift in my seat. The faces in the crowd blur. Hey, these people waiting. They're new. New faces. That means we're definitely next! "Seventy-five. Number seventy-five!" WTF!?! Why are they going backwards? Maybe we should get a snack. It's 1:30 already! Aren't you hungry? I'm hungry. I am reminded of the Chinese restaurant episode on Seinfeld. Fifty minutes. Okay. Any time now. "Ninety-one. Number ninety-one!" Woo hoo! That's us! That's us! We leave the dim sum limbo, and all those hungry saps still in it. We enter an elegant space, clean white linen tablecloths, sparkling overhead lights, the aroma of food. Are we in heaven? Might as well be. We quickly jot down our order on the provided sheet of paper, which has nothing but Chinese characters on it. This isn't a roving cart kind of place, so we carefully pick from the photo menu and transcribe the numbers onto our order sheet. The prices range from $1.98 for the Small, $3.20 for Medium, and $3.95 for Large. 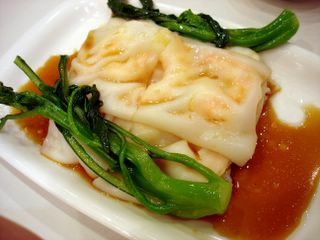 First to come was the Tofu in Abalone sauce, which was silky smooth. 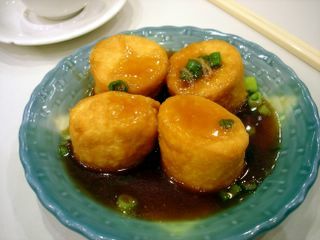 The mild-tasting custard of the tofu a perfect blank palette for the briny brown gravy and diced scallions garnish. The texture was so supple and soft that slurping is probably the only way to not waste a single curd. The Spare Ribs was luscious and fatty; just the way I like it. Sweet and tender, I the meat came off the bone with a gentle tug. The flavor of fermented black bean was absent from this dish, but I didn't miss it. There was nothing obscuring the pig flavor and essence from reaching my palate. 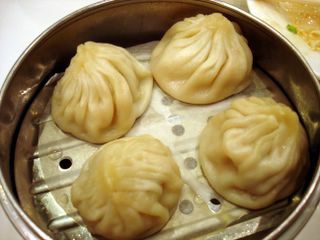 The Juicy Pork Dumplings, came in tight purses which burst with hot broth when I bit into it. These rival those I've had at Din Tai Fung, although I missed the tangy tartness of the vinegar dip that is normally served on the side. I rely on that vinegar to cut through the fatty pork, but this time, Sea Harbour only provided a saucer of soy with a dab of shredded ginger. Still great though. 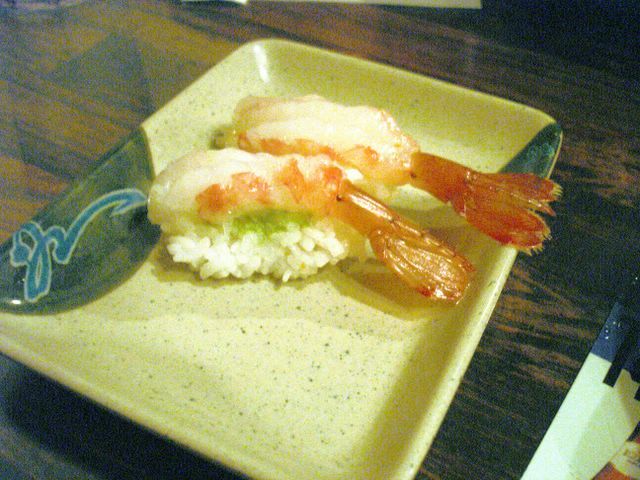 Next was the Shrimp Wrapped in Rice Noodle. The rice noodles were pleasantly chewy and soft, but the shrimp had a little too much cornstarch which muted its freshness. The thin soy sauce "broth" that doused it was perfect and slightly sweet. The Seafood Roll was the standout of the savory dishes we had. Crepes were stuffed with mayo and large chunks of scallops and shrimp, then breaded and deep fried. 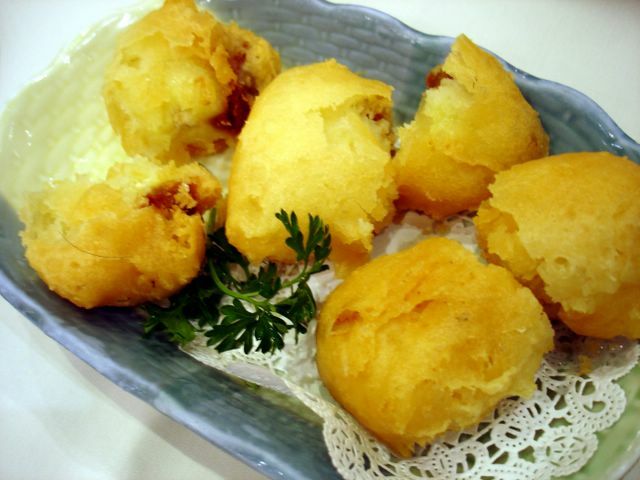 A textural contrast of the crispy and creamy. A few sips of hot tea will be necessary to offset the richness of this dish. We ended our meal with another fried dish. This time it indulged our sweet tooth. The Fried Banana had a hard outer coating, massively crunchy. The interior was the exact opposite; the banana was so soft, it oozed. There was a thimble sized nub of sugary red bean paste hidden inside as well; a pleasant surprise. 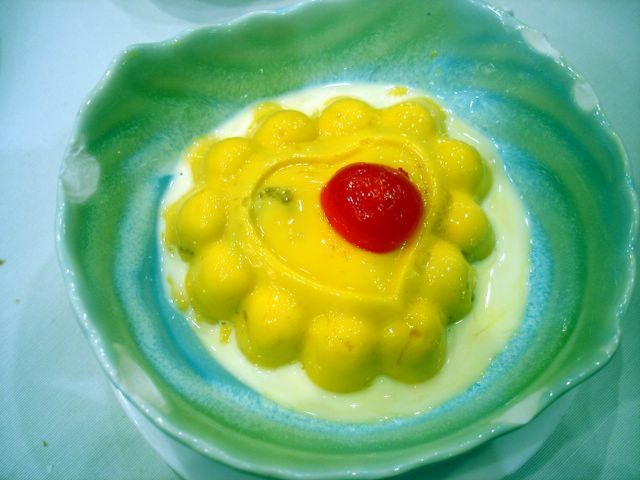 The final sweet dish was the Mango Pudding in a puddle of sweetened milk. This puts every other mango pudding dessert I've had at dim sum restaurants to shame. Why? This actually tasted like mango! Silken, pulpy pieces of the fruit was embedded within and all throughout. Unlike those lesser renditions that rely on orange food coloring for brightness, Sea Harbour's mango pudding took their cue from nature. And just look at that cute heart-shaped mold they used. Just darling! From dim sum purgatory to dim sum heaven in 50 minutes! *Note: The Rowland Heights Sea Harbour has been sold. It is now called Happy Harbour. 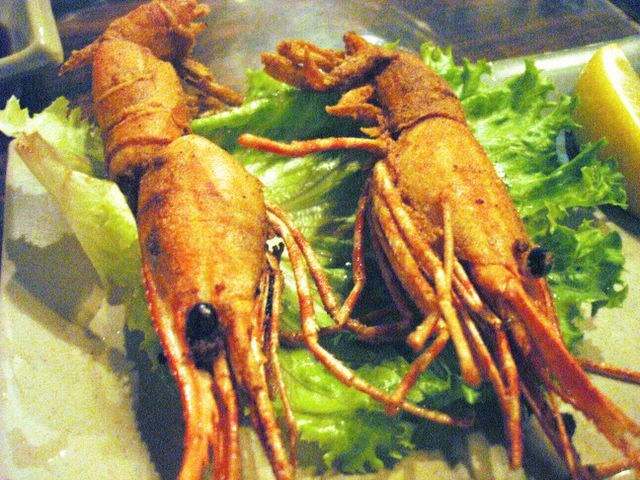 Well, I finally got my fix for deep fried shrimp heads last night. This after two marvelous and drool inducing posts from Pam of Daily Gluttony and Kirk of mmm-yoso! implanted the idea into my head. Tommy's Sushi in Tustin would be where I would feed my craving and, hopefully, banish that goddamn song out of my brain! Tommy's is one of those neighborhood sushi joints that, I gather, has been there forever. As such, the clientele are mostly locals looking for california rolls and teriyaki. And they're a raucous bunch, toasting each other happily at the sushi bar with their Sapporos held high. It's just about impossible to get a seat at Tommy's on a Friday or Saturday night. The atmosphere befits a joint of this type. 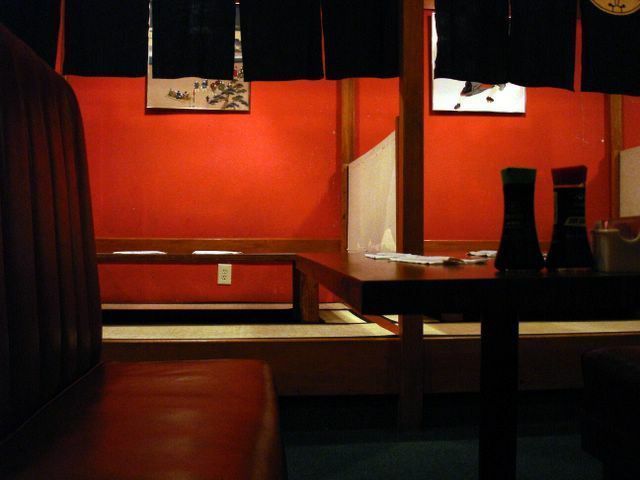 There are booths that look like tatami rooms, but with the middle dug out for your legs. Kitschy red paper lanterns dangle in a dimly lit room. And it's perpetually dark in there since no windows exist to let in any ambient light. The food is not up to par with more traditional establishments like Shibucho, but you'd be silly to expect that it could be. The sushi Tommy's serves can be a hit or miss, and most of their combos, usually containing a teriyaki of some sort, is uninspired. But they do two things well. Actually, very well, in my humble opinion, bringing me back again and again. They are, of course, the deep fried shrimp amaebi heads and the poke bowl. The poke bowl, going for $9.75, is the best value Tommy's offers. 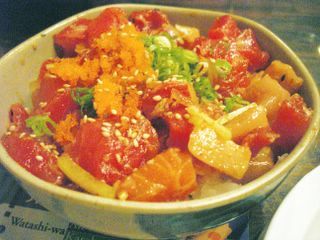 A healthy mound of tangy sushi rice is topped with a generous helping of crabmeat, julienned cucumber, capelin roe, chopped green onions, and chunked raw tuna and salmon dressed in a tart and spicy dressing. 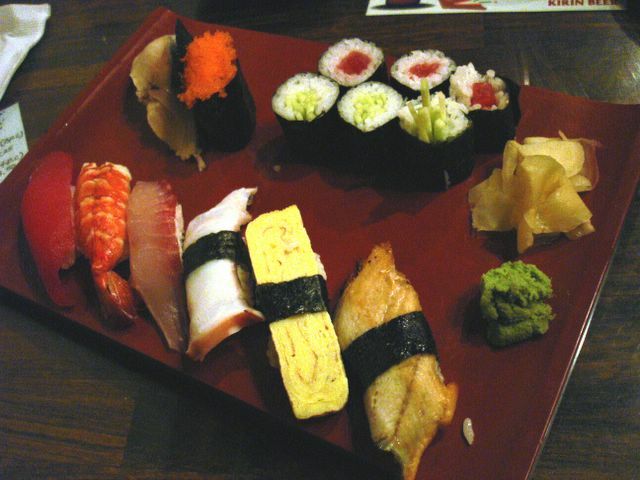 The bright colors are a feast for the eyes while the fresh and silky textures satisfies the palate. This would be a filling meal for those dining alone. The combo sampler of nigiri ($11.95) was less successful. The hirame (halibut) tasted off, while the others were no better than anything I've had at Sushi Boy. My girlfriend and I agreed that after our Shibucho experience, this nigiri wasn't up to snuff. ...which, of course, were great! These leftover shells and heads, byproducts of the raw shrimp nigiri sushi, are rendered until crackling in boiling hot oil. Then it is served golden and crispy with a wedge of lemon. Biting down on the feelers, eyeballs, antennae, head and carapace results in a lovely crunch, similar in texture to an extremely well-done, deep fried soft-shell crab. Like divine pork rinds of the ocean, with a briny pulpy center and spiky appendages that could easily poke a hole through your cheek, I realize that it is an acquired taste. But it is one addiction that I am always happy to indulge.